A February day when the temperature reached the high 70s in Pittsburgh seemed like the perfect time to talk about climate change — and aligned with the Fossil Free Pitt Coalition’s pre-planned attendance at a public Board of Trustees meeting. The 38-person board — who, according to their website, “ensure[s] that Pitt meets its obligations both to the Commonwealth of Pennsylvania and to society” — held a public meeting Friday morning in front of a full crowd in the William Pitt Union assembly room. Numerous people were scattered across the room with clusters of students wearing orange shirts that read “Divest Pitt” across the chest. The students were there representing the Fossil Free Pitt Coalition, a partnership of more than 35 student organizations that has long been urging University administration to divest itself of fossil fuels — to stop investing in industry that burns fossil fuels in an effort to remedy climate change. Sage Lincoln, a senior majoring in geology, ecology and urban studies, is one of the core members of the FFPC and was instrumental in directing the organization for Friday’s meeting. Pitt’s Board of Trustees revealed last February — due to pressure from the Coalition — that it invests $26 million in the fossil fuel industry. That money comes from Pitt’s more than $3.5 billion endowment fund. Other universities, including Stanford University and San Francisco State University, have divested of fossil fuels. Sophomore ecology and environmental studies double-major Sarah Grguras said if Pitt were to do the same, it would send a message about the University’s priorities. “Climate change is happening today, and if the University would divest they would create a statement that the fossil fuel industry is contributing to climate change,” Grguras said. The group was not at the meeting to protest or antagonize, said Lincoln, but instead to make their presence known and to speak directly with board members. The coalition brought a group of 24 students to sit in on the meeting, including Student Government Board Vice President-elect Zuri Kent-Smith. “With my new position, I really want to see what I can do to better organizations like this,” Kent-Smith said. Two representatives for a national organization were also in attendance, Patrick Young and Marcie Smith. The pair are staff members from the Responsible Endowments Coalition, which aims to “foster social and environmental change by making responsible investment common practice amongst colleges and universities,” according to the organization’s website. The board did not discuss divestment during the nearly two-hour meeting. Instead the board passed several motions to rename buildings on Pitt Bradford’s campus and to hear from candidates for Pitt’s Senior of the Year — which anthropology, chemistry and neuroscience major Marcus Robinson won. The meeting was open for public viewing but not input. Only the board members and seniors on the panel were given a chance to speak. The students with FFPC had to wait until the meeting was over to address the Board. 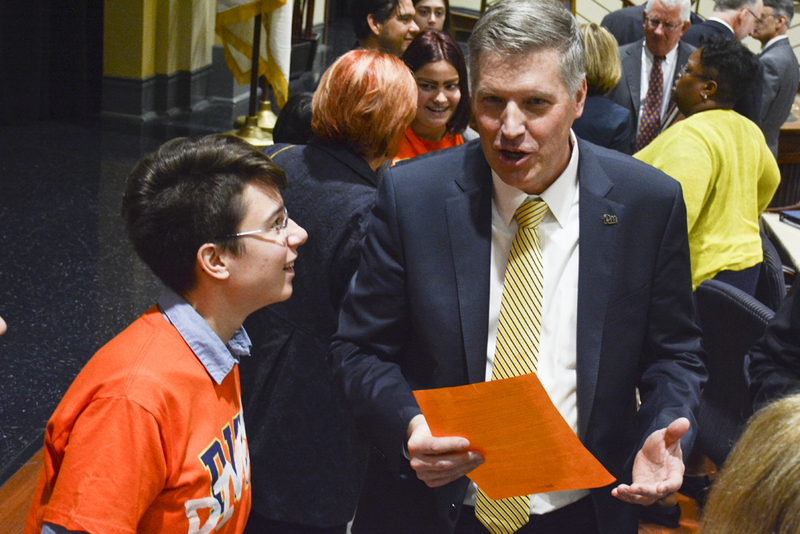 Once the meeting concluded, several students, including sophomore Larisa Mednis, handed out flyers and spoke directly with Provost and Senior Vice Chancellor Patricia Beeson and Board Member Douglas Browning about divestment. The Pitt News approached several board members, including Browning, following the meeting but they declined to comment. “I can’t be an advocate against my own board,” Gallagher said. October, 2014: The Fossil Free Pitt Coalition forms with four goals. The first two ask Pitt to freeze new investments into the 200 largest fossil fuel companies — collectively called the Carbon Underground 200 — and to divest all direct holdings from the Carbon Underground 200 within three years. The coalition also asks that Pitt divest all direct and commingled funds from its more than $3.5 billion endowment within five years. The last ask is that the University institute a formal process between the faculty, students and the administration to responsibly reinvest the money. December, 2014: Following what the coalition calls a “blitz week” of flyering and campus activism and its first meeting, FFPC has its first meeting with University administration, including then Vice Provost and Dean of Students Kathy Humphrey. March, 2015: With more than 1,000 petition signatures and 10 official members — including Active Minds, the College Democrats and the Fair Food Cooperative — FFPC has its second meeting with administration. This time, then-interim Vice Provost and Dean of Students Kenyon Bonner and Chief Investment Officer Amy Marsh, among others, are in attendance. The University denied funding for the $600 necessary to get information about where the University’s direct holdings were invested. The FFPC fundraised the money on its own by September of that year. November, 2015: In another meeting with University administration, the FFPC is denied a meeting with the Board of Trustees. “If we do not get a reasonable timeframe from the administration we will do what it takes to have our voices heard,” the coalition said in a press release about the denial. February, 2016: Pitt releases information about how much money is invested in fossil fuels. About $26 million of the University’s $3.6 billion endowment — one of the largest in the country — is invested in the Carbon Underground 200 list. According to Marsh, $8 million is invested directly in coal companies and $18 million in oil and natural gas companies. The University invests $2 billion of its endowments in commingled funds, which in turn invest their money in many different companies. Some of those commingled funds might invest in companies that make fossil fuels. Later that month, Lincoln and Grguras made a presentation for divestment to the student affairs committee of the Board of Trustees. This was the first time that students were allowed access to a board meeting, according to a press release. Board Chairperson Eva Blum agreed to discuss the issue again over the summer during an executive committee meeting, Bonner told The Pitt News in October, 2016. Summer, 2016: Bonner tells Grguras the University has not made a decision, but the board recommended to send the issue to the investment committee, to discuss strictly as an economic issue. October, 2016: The Faculty Senate — headed by Pitt Greensburg professor Franklin Wilson — forms a committee to investigate the fossil fuel divestment issue. While the Faculty Senate does not have any decision-making power, Bonner said that a recommendation through the faculty assembly would have an influence on the board. Wilson hadn’t met with the FFPC before forming the committee, but was influenced by its goals. He didn’t think the research would take long — he estimated spring semester — but there has not yet been an announcement on the committee’s decision. July, 2016: Bonner tells the students from FFPC that the board has decided not to consider the issue as a matter of social responsibility, but is still investigating the economic angle. December, 2016: After hearing the investment committee of the board denied the divestment proposal, the FFPC set up a 200-foot long cardboard pipeline in the Cathedral of Learning as an act of protest. In a two-hour meeting that included now-Senior Vice Chancellor Kathy Humphrey, the administration suggested the FFPC submit a formal research proposal, which the administration would fund. February, 2017: The administration informed the FFPC that it would choose a faculty member to do the research and manage the timeline. That faculty member has not yet been chosen and the coalition is waiting to hear from the administration with further details. As more senior coalition organizers prepare to graduate, younger leaders are prepared to maintain pressure on the University. Bonner, who has been working with students for more than two years on the issue, said they have been passionate and reasonable in working within the system — but that this kind of change takes time. A single sentence in the Board of Trustees bylines stipulates the board should only make decisions about investments in economic terms — issues of social responsibility have to be extremely pressing in order to justify divestment. In the 1980s, the board agreed, for ethical reasons, to divest about $7.5 million from South African companies that were contributing to apartheid. Editor’s note: A previous version of this story reported that the Board of Trustees voted on Pitt’s Senior of the Year. This is not the case, and the story has been updated to reflect the changes. The Pitt News regrets this error.